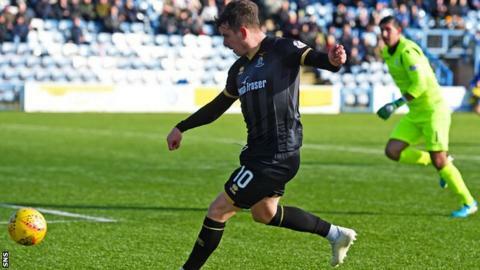 Inverness Caledonian Thistle scored two first-half goals to beat Queen of the South and stay a point off the Scottish Championship play-off places. Aaron Doran fired the visitors into an early lead and Brad McKay headed their second. Andy Stirling, Stephen Dobbie, Fraser Aird and Lyndon Dykes threatened for Queens but to no avail. And the Dumfries side remain seventh, with Falkirk a point behind and Partick Thistle two points further back. Match ends, Queen of the South 0, Inverness CT 2. Second Half ends, Queen of the South 0, Inverness CT 2. Corner, Queen of the South. Conceded by Carl Tremarco. Corner, Queen of the South. Conceded by Jamie McCart. Attempt saved. Jordan White (Inverness CT) header from the centre of the box is saved in the centre of the goal. Substitution, Inverness CT. Shaun Rooney replaces Charlie Trafford. Sean Welsh (Inverness CT) wins a free kick in the attacking half. Darren McCauley (Inverness CT) wins a free kick on the right wing. Substitution, Queen of the South. Connor Murray replaces Fraser Aird. Substitution, Queen of the South. Ian McGrath replaces Iain Wilson. Iain Wilson (Queen of the South) is shown the yellow card for a bad foul. Attempt missed. Sean Welsh (Inverness CT) right footed shot from outside the box is close, but misses to the right. Attempt missed. Liam Polworth (Inverness CT) right footed shot from outside the box is close, but misses to the left. Corner, Queen of the South. Conceded by Mark Ridgers. Attempt saved. Stephen Dobbie (Queen of the South) right footed shot from the centre of the box is saved in the bottom right corner. Attempt missed. Andy Stirling (Queen of the South) right footed shot from the centre of the box is close, but misses to the right. Attempt saved. Lyndon Dykes (Queen of the South) left footed shot from the left side of the box is saved in the bottom right corner. Corner, Queen of the South. Conceded by Charlie Trafford. Attempt saved. Stephen Dobbie (Queen of the South) left footed shot from the right side of the six yard box is saved in the bottom right corner. Attempt missed. Jordan White (Inverness CT) header from the centre of the box is close, but misses to the right. Corner, Inverness CT. Conceded by Callum Fordyce. Attempt missed. Jamie McCart (Inverness CT) header from the centre of the box is close, but misses to the right from a direct free kick. Aaron Doran (Inverness CT) wins a free kick on the left wing. Corner, Queen of the South. Conceded by Brad McKay. Substitution, Queen of the South. Jack Leighfield replaces Alan Martin.